Properties can be assigned to the entire node as well as to each surface of the node (in case if a node is an object). You can assign multiple properties to a single node. A property can be edited via the Property tab of the Parameters window: it becomes available when the target property is selected in the Properties hierarchy. You can also edit property parameters via the corresponding section of the Node tab of the Parameters window, when a node is selected (see below). You can also drag the desired property from the Properties hierarchy directly to the corresponding field in the Parameters window. Check also the alternative ways of assigning a property to a node. To set the parameter to the default value, click right next to the field with the property name. 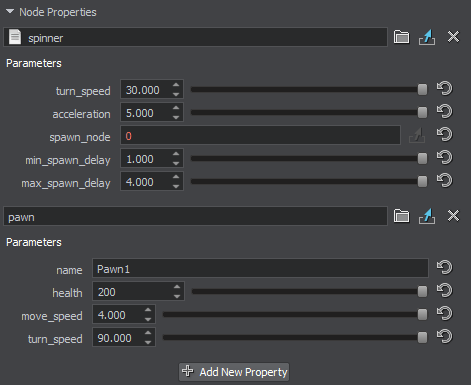 To add a new property slot for the node, click Add Property. When a property is assigned, its parameters are available for editing. If you modify a property parameter (parameters) of a node via this interface, an instanced property will be saved to the .world or .node file. Rather than all the parameters of the property, it will contain only the modified ones. Check also the alternative ways of assigning a property to a surface. To set the parameter to the default value, click right next to the field with the property name.